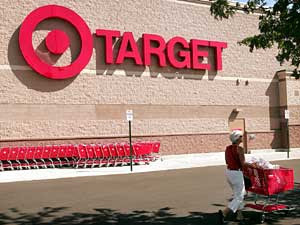 Target Corporation, the large retail chain, is coming under fire for donating to a Minnesota business organization that is running ads supporting a conservative Republican for Minnesota governor. Specifically, pro-homosexual and pro-illegal immigrant groups are targeting the company for boycotts. Target gave $150,000 to MN Forward - a pro-business organization devoted to electing pro-business candidates in Minnesota. MN Forward is running a television ad that supports Tom Emmer, Republican candidate for governor. Homosexual supporters are mad because Emmer is "anti-gay" (in other words, he supports traditional marriage between one man and one woman - just like 65% of Minnesotans), and labor unions like SEIU are upset because Emmer is "anti-immigrant" (i.e. supports the Arizona immigration law, is against illegal immigration, and filed a bill to make English the official language of state government). This has led to those two groups, labor unions and homosexual "rights" supporters, to launch boycott movements against Target. Additionally, it has led the San Francisco Board of Supervisors (essentially, the city council) to reconsider allowing Target to open two new stores in San Francisco, solely because of Target's contribution (two of the eleven Supervisors are homosexual). Target has stated that their reasoning behind the donation to MN Forward was just based on economic issues - they are based out of Minnesota, and want a business friendly state government. However, that's not enough for San Francisco Supervisor and mayoral candidate Bevan Dufty (one of the two homosexuals on the board). "There was a lot of sentiment for people who wanted the stores to open, and this [MN Forward donation] clouds that. It's not only the cash. It's the ham-handed way the company tried to explain it away: 'We supported this person based on their position on economic issues.' Well, that's just not satisfactory." So now, because one business exercised their right to political free speech, San Francisco government is discriminating against them. It's a sad day when government will punish private companies and individuals for exercising their Constitutional rights. Ironically, MN Forward is not supporting only Republican candidates - they have endorsed and are supporting through independent expenditures Emmer (Republican for governor), two Republicans for state house, one Democratic-Farmer-Labor candidate for state house, one Republican for state senate, and two DFLers for state senate. That makes four Republicans, and three DFLers. On another note, MN Forward is not the only group doing independent expenditures in the Minnesota governor's race. Labor unions are attacking Emmer and supporting the Democrat. FactCheck.org has a fantastic piece here, entitled Corporate-Labor Smackdown in Minnesota, detailing how MN Forward is running a factual ad supporting Emmer, and the labor unions are using misleading and false ads. 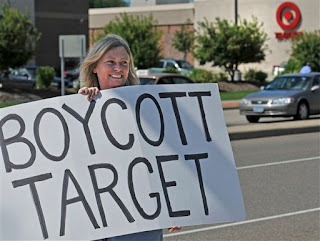 I already boycott Target because they don't allow Salvation Army bell ringers at their entrances during the Christmas season (ironically, they still support Salvation Army's online Angel Tree Program). Between gays, labor unions, and Christians all boycotting Target, will they survive? It is very disturbing that a city government should boycott a company however. Governments can do embargos, tariffs, etc.. but a boycott is by definition an individual protest. Also, any type of political sanction taken by a government is usually against another government--not against a domestic entity. But what else would you expect out of San Francisco? When coming up against an individual or company who happens to disagree with them, the first thing liberals seem to want to do is boycott them. I suspect they see this as a punishment of sorts. Simply put, they can't stand it when someone doesn't go along with their liberal viewpoints and they are ready to cry foul at the drop of a hat. Iran's Nuclear Program - What Will Israel Do? Will Huckabee Put Lankford Over the Top?